UPS And Free Shipping—You Get What You Pay For – What Were They Thinking? When I order certain hardware from Apple, I usually have to wait for it be configured and shipped from China, such as the 2016 version of the 15″ MacBook Pro with Touch Bar. Since I wanted a higher-than-baseline amount of RAM (16 GB) and storage space (2 TB SSD), this is a requirement I’m okay with when buying one of Apple’s devices. Like most people, I also prefer paying the least required, but when it comes to Apple’s use of UPS for shipping, either the carrier is overwhelmed by the amount of work they have or they need a logistics master at their helm. When I ordered my new system, I added a few cables to the order for use with certain devices (USB-C is the only kind of port these new MacBook Pros have). Since the cables were available, they shipped immediately rather than with the computer. Since the cables weren’t of any use to me without the computer, I would have been fine with them being shipped with the system, but that was Apple’s choice. Even more surprising, the cables were sent in two separate shipments rather than in one shipment all together. Well, that’s Apple’s money! When one set of the cables arrived, I was not at home, so I expected the driver to leave them at my door or use my community’s secure parcel management system. However, on the notice placed on my door was a checkmark next to the line that said I had to be present to sign for them. I have to be present to sign for $20 cables? I logged on to Apple’s order page and read that the cables were clearly labeled as NOT needing a signature. When I called UPS to inform them of their mistake, I was told they handle Apple’s deliveries differently—in other words, even when Apple tells them they don’t need a signature, the driver will require a signature…for a set of $20 cables. I told the UPS customer service representative that my community provides a set of lock boxes that are even more secure than leaving with a concierge or community management office and said we pay for these and expect them to be used, and that UPS’s competitors have no problems with their use. The next day when I was not home, the driver dropped off my $20 cables using the service my community has, and I was able to pick them up with no incident at my convenience later that evening. Two days later, my remaining cables arrived (the total value of these were less than $20), and I could repeat the circumstances that happened verbatim. Except this time when I talked with the UPS customer service representative, I asked why their driver didn’t learn from his mistake a few days ago. I was told that perhaps there were two separate drivers. In even an imperfect world, you’d expect someone to issue a memo to all drivers about issues that were encountered and how to avoid them. Earlier this week, I finally learned my new computer was going to arrive, so rather than go through that rigamarole again, I remained home on the day it was to be delivered. Finally, after 7:30 pm, I called UPS customer service to see if they knew what was the hold up. I was informed the driver was still making deliveries and that he would make mine that night before he headed back to the office. While speaking with the representative, I was informed that UPS would allow me to log in and electronically authorize my package to be left on my porch, by the front door, etc., but that I could not authorize it to be left with my community management’s office nor in the package delivery lock boxes available for this purpose. 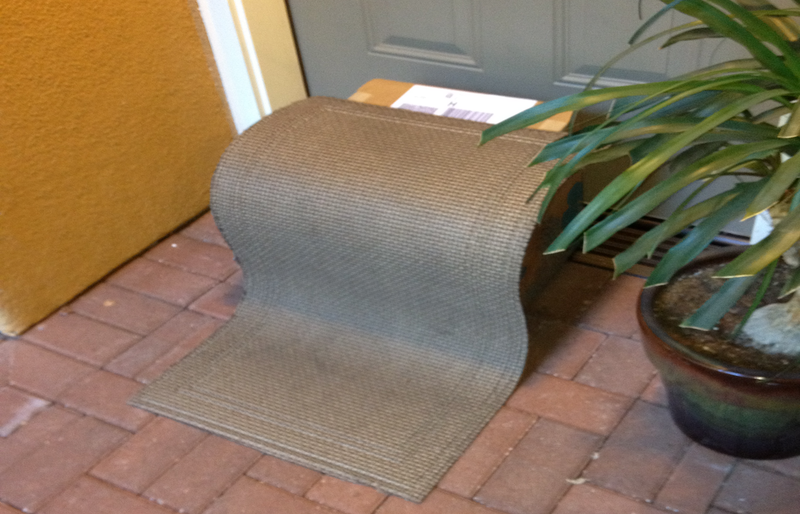 UPS thinks it’s more safe and secure to leave a package by someone’s front door than with a person or service designated for that purpose? There are no words strong enough to describe the faultiness of such logic. At 8:36 pm, when I was about to go out for a quick five-minute errand I’d been holding off on for many hours, the UPS driver arrived carrying the small box containing my new computer. My package was his last delivery, one that required me to be present. I asked him if he’d had an issue getting in to the community due to the late hour like a driver had earlier in the week whom I’d let in when his key didn’t work. He said that was him but he’d gotten things fixed—no need for memos from one driver to another then, I thought. I should have also asked how many packages he’d delivered earlier in the day that did NOT require someone to be home like me, someone who’d been waiting for over 12 hours. The possibility of theft is great, and lately we’ve seen in the news how home owners have placed fake packages or used security systems to catch people stealing packages left by delivery services. In many communities with a centralized property management office, the staff usually receive packages for its residents who aren’t at home, a service very useful for people who work for a living. In some communities, systems like those provided by Parcel Pending have been installed to provide greater security and convenience to both parcel delivery staff and residents and should not be ignored by UPS or other delivery services. And who knows? Maybe Apple’s CEO Tim Cook should personally buy UPS with the money he’s earned from his stock grants and options and fix the delivery service—operations is definitely one of his specialties. I’m not so sure Apple should buy UPS, although some firms are developing their own delivery service, and maybe that’s a route Apple should consider. Whatever causes people to have common sense.